Our Wiltshire natural oak range boasts rounded corners, distinct wide beading on the drawers and door fronts, and a subtle arched base. 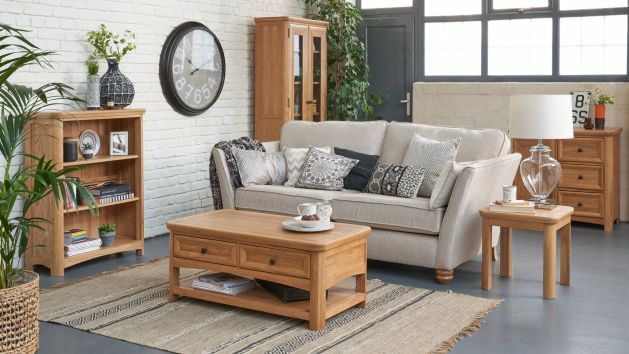 The Wiltshire range of furniture is packed full of high quality details, so it will truly stand the test of time in your home. It is crafted from a-grade solid oak timbers, and is finished in our beautiful natural wax finish, nourishing the wood, and giving a protective sheen to each piece. Wiltshire boasts lots of traditional design details, influeing gentle rounded corners, and distinct wide beading on the drawers and door fronts. Wiltshire is a range with a softly curved outline and is full of personality. Retro and feminine, Wiltshire features softly squared knobs, a good contrast to the pale-coloured oak, and subtly arches bases to complete the look. The bases feature a subtle arched detail, which finishes the look of the furniture. We have pieces available for every room, from the dining room to the bedroom, so browse our full Wiltshire collection today. Don't forget about our fantastic free delivery options! Browse the full range today!